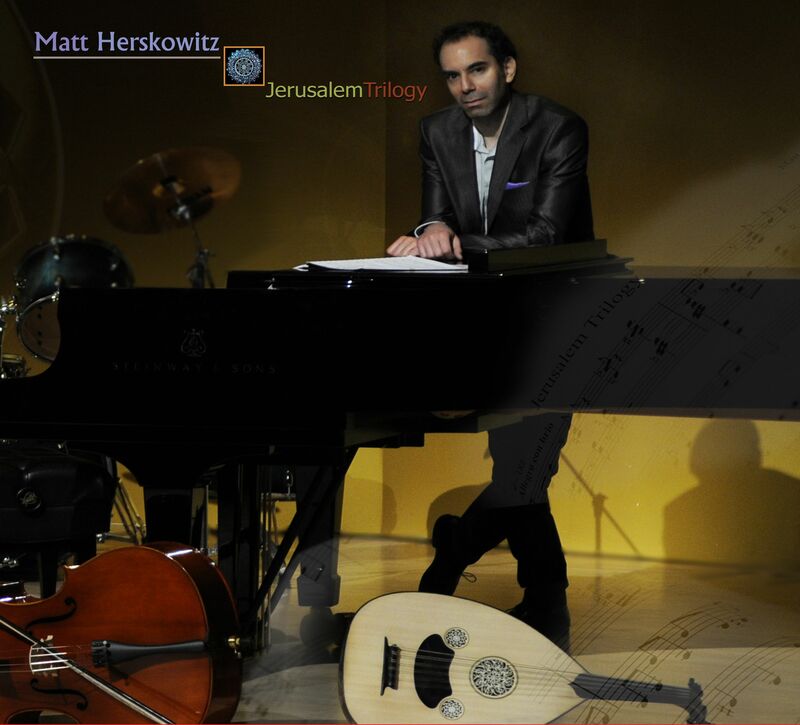 Jerusalem Trilogy Compositions of Matt Herskowitz: A return to the pianist/composer that has gone missing for almost a century, this program features my crossover compositions, a unique blend of contemporary classical and progressive jazz. The centerpiece of the show is my composition Jerusalem Trilogy for piano, bass, drums, violin and cello, a 20-minute long piece in 3 movements which seamlessly blends together a unique fusion of Jewish and Arab musical styles and grooves. Another original composition on the program is my Polonaise Libanaise, with a loose reference to Chopin's F# minor Polonaise, op. 44. This piece has an equal balance of written music and improvisation, stylistically comprising a witty blend of Polonaise rhythms and Arabic modes and grooves. Other pieces on the program include my original arrangement of the classic Yiddish song Under Your White Starry Heaven, which begins with a composed arrangement for violin and cello, then joined by the trio in a more improvisatory context. This is an incredibly moving melody that resonates with its heartbreaking simplicity. There are two other arrangements on the program as well: my arrangement of the classic French song Gottingen, by iconic French singer Barbara, for my trio + string quartet in a soft klezmer style, and my arrangement of Prokofiev's wicked Étude in C minor, op. 2 no. 3, one of the most difficult études ever written for the piano, enhanced in this arrangement for the trio, called Prokofiev's Revenge. Finally, the third original composition of the program, Crossbones, is a hard-edged, driving contemporary jazz/rock/fusion piece for the trio, compositionally in the same family as the Polonaise Libanaise and the Prokofiev arrangement. The program in its entirety represents a new kind of chamber music, one that fuses together different but compatible musical styles, combines written music with improvisation, and is centered around a jazz trio that plays classical music. This group and this program present an innovative concept of the future of chamber music, where I believe it is inevitably heading.